Our very first Symposium was held in 2007, themed “The Ethics of Wealth Creation in South Africa”. The Symposium brought together thought leaders from society to discuss and interrogate topics related to the theme at hand. Inspired by the success of 2007, the Annual Thought Leadership Symposium was established in 2014 and continues to draw a growing audience from across South Arica and abroad. The Annual Thought Leadership Symposium is a platform for open discussions, which aims to empower others with a similar vision to work towards the growth and development of our country and continent. The Foundation provides a new topic each year challenging thought leaders on pressing social, economic and business issues facing our nation. The Annual Thought Leadership Symposium aims to include and expose emerging leaders from government, business and civil society to the thinking, discussions and point of views from renowned and respected thought leaders. The event attracts a variety of participants from various sections of society, academics, educators, business leaders, employers, representatives from the non-profit sector and youth to join the discussion each year, to engage with other industry leaders, to share knowledge and inspire change through valuable insights. 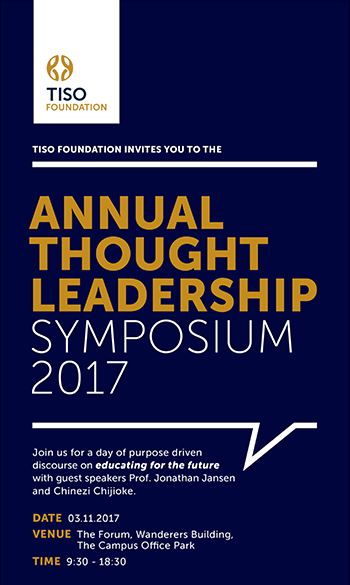 The theme for 2017’s Annual Thought Leadership Symposium was “Educating for the Future”. Skills requirements for the future. The vast section of society that cannot access the economy. The impact of technology on employment.